For the ultimate cheesecake lover! 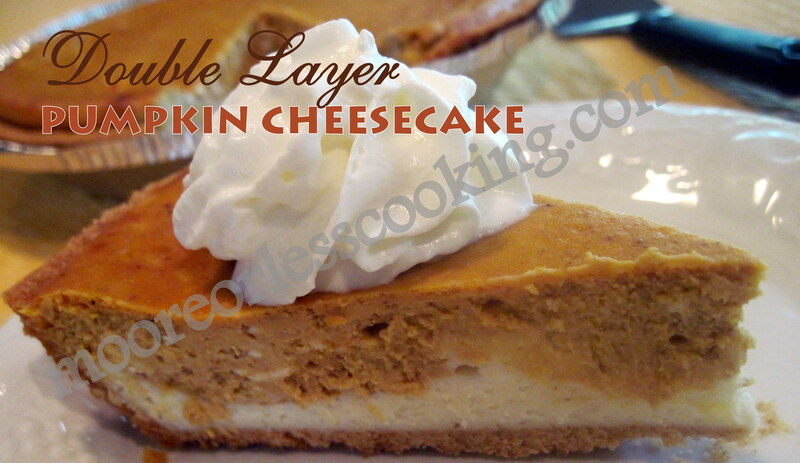 A double layer of cheesecake and a layer of pumpkin cheesecake! The perfect way to celebrate the holiday! Cooler weather is taking over Maine and fall recipes are calling my name. 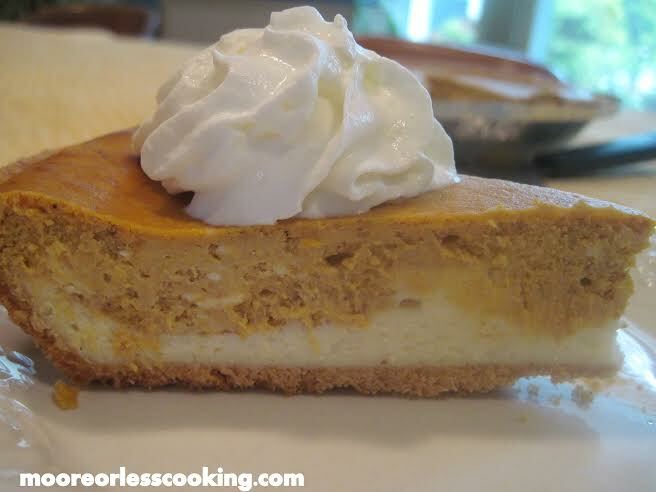 I have been wanting to bake a pumpkin cheesecake for a while, after seeing this double layer cheesecake from The Girl Who Ate Everything, I just had to give it a try. The name double layer caught my eye, a Double layer is always better, right? I used a prepared Graham Cracker Crust, so this recipe can be prepared quickly for a dessert that you need in a pinch, just give it time to chill in the refrigerator. We all enjoyed this cheesecake, I am excited that it will be on our Thanksgiving table this year. In a large bowl, combine cream cheese, sugar and vanilla. Remove 1 cup of batter and spread into bottom of crust; set aside. Don't worry if there are a couple of cracks; when you refrigerate it they will close up. Allow to cool, then refrigerate for 3 hours or overnight. Recipe adapted from The Girl Who Ate Everything, Allrecipes. Nettie Moore is the cook, baker, photographer, and designer behind Moore or Less Cooking Food Blog. Nettie is a self-trained cook and baker. She loves creating easy recipes that don’t call for a lot of unknown ingredients. Nettie’s Blueberry Skillet Cake has been featured in Taste Of Home Magazine and her Peach Raspberry Pie has won awards! She was born and raised in Southern California and now calls New England her home, where she lives with her husband and two children. Follow Nettie on her blog, Moore or Less Cooking, or on FACEBOOK | TWITTER | GOOGLE+ | PINTEREST | BLOGLOVIN | INSTAGRAM| Free email subscription here. This pumpkin pie looks awesome Nettie! I’d love a big slice right now with my tea. G’day Love pumpkin! Love cheesecake Nettie!! I could go for a slice right now!